It’s encouraging to see so many B2B marketers adopting marketing automation technologies such as HubSpot, Pardot and Marketo. If marketers are going to support sales teams, we have to help them create buying experiences that are aligned with the realities of how B2B decision makers buy. Those tools will go a long way in helping us do that. Another thing that I hope my industry will be just as passionate about this year: persuading our peers in sales to drop their percentage-based sales cycles. By “percentage-based sales cycle,” I mean this: seeing the consumer decision journey as steps in a sales-driven process (e.g. “The prospect requested an RFP – they must be 40% along the path to purchase.”). It’s important that marketers help sales move away from that kind of lead scoring (and point of view) because percentage-based sales cycles are hopelessly out of touch. They in no way reflect an accurate measure of how far a buyer is “down the path.” They are thoroughly incompatible with today’s understanding of the consumer driven decision journey. Countless pipeline projects are ineffectual. Leads are squandered for lack of accuracy of understanding. Time, effort and money is wasted. It’s incumbent on us to spark this change because marketers represent the voice of the customer. That’s how we empower sales with insights into not only why customers buy, but how. That’s also how we develop the sales tools (and shape the sales behaviors) with the most efficacy. Sales won’t be motivated to make this change on their own. 1.) Percentage-based sales cycles are rooted more in sales force intuition than buyer needs. Research shows that B2B buyers are as far along as 60 to 90% through the buying process before reaching out to sales reps. Because it’s designed to accommodate the behavior of the sales force, a percentage-based sales cycle can’t compensate for this radical shift in buyer behavior. Arbitrarily saying “When the prospect requests a meeting, they’re at 25%” won’t cut it any more. Those frameworks trap sales and marketing in some bad habits because they let us justify herding prospects into percentage buckets based on a sales-driven notion of how the buying process should go. It keeps us from creating the buying experiences that B2B prospects want. It stifles our potential. 2.) The more complex the offering, the more idiosyncrasies you will see from deal to deal, need to need, and buyer to buyer. It doesn’t matter whether your product is software, oil field services equipment, industrial lamps or commercial loans – B2B buyers are looking for content that will help them evaluate your products and their needs. They are doing extensive research online before reaching out to sales reps. That means the prospects that do include your offerings in their decision set will come to you with a variety of needs and multiple decision makers with unique points of view. That complexity will only be compounded if your offerings can be tailored for specific situations. A percentage-based sales cycle may equip you with a process, but it’s hardly consistent because it’s based on one person’s point of view – and a sales-driven one at that. 3.) Percentage-based sales cycles are a nightmare for sales, marketing and buyer alignment. Percentage-based sales cycles are often structured in ways that prevent marketing from providing sales the most effective lead nurturing tools. Those types of frameworks dictate that marketers time their communications in a forced manner that is offering-centric and sales-driven instead of buyer needs-focused. It’s like an elevator stopping at each floor on the way up, even though you only pressed the button for “12”. It’s hard to build a buying experience around a sales process that sees the buying steps as “25%: Preliminary Meeting with Prospect,” “50%: Needs Identified” or “75%: proposal requested.” These frameworks leave marketing on the sidelines during the initial steps (at a minimum) of the buying process – the steps that are the most critical in shaping and influencing the way a B2B prospect determines needs (and fit). There’s no provision for lead nurturing activities! Why would any smart business leader not use all the tools available to secure new business? Well, it happens all the time. The result is low close rates and high customer acquisition costs. 4.) There’s a better alternative - a sales cycle rooted in behavioral change. That is the best way to create buying experiences that suit how B2B prospects actually buy. How can marketers help sales abandon percentage-based processes? By teaching sales a better alternative - one that is based more on science than intuition. 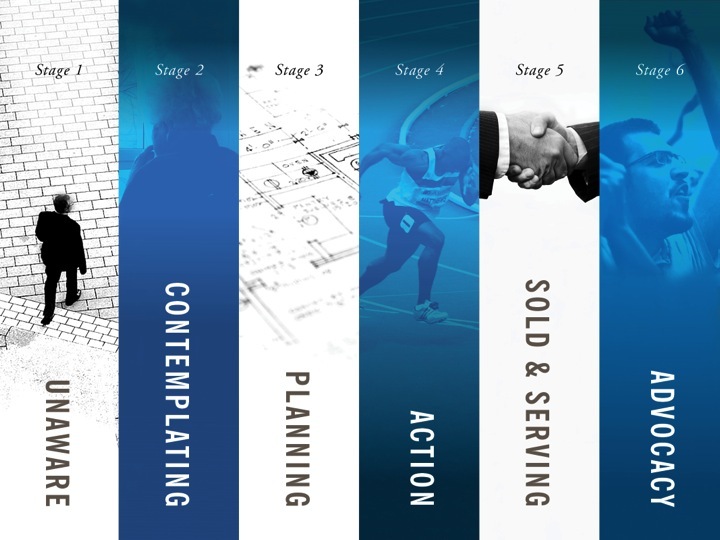 Over the course of a 25-year career in sales and marketing, I’ve learned that sales transactions are the result of a journey through a behavioral change process rooted in psychotherapy. Behavioral science helps marketing and sales distill the buying process down into a uniform series of stages that are consistent from buyer to buyer, regardless of offering. It provides clarity to the tough questions: How do buyers’ needs change throughout the buying process? What behaviors do those needs influence at each step of the way? Most importantly, what can marketing and sales do to guide (or influence) those changes in behavior? To sell more. More effectively. Understanding the stages of behavioral change will also enable marketing and sales to build alignment around buyer needs. Sales and marketing will be able to talk about prospects in a common vernacular! Pipelines will align more closely to actual results. Customer acquisition costs will drop. That alignment will allow us to jointly diagnose where prospects are along the path and act accordingly. It will help marketing and sales apply the right tools and behaviors as appropriate. Specific goals and techniques can be applied to the tools and actions used by the sales force at each stage of the buying process. Sales will be able to focus on the prospects that are actually ready to buy. Marketers will finally be able to create buying experiences that make an impact. Sales teams look to marketers for guidance, insight and tools in pursuit of more deals today. Our bosses rely on us for long-term focus in pursuit of better opportunities and better offerings tomorrow. If marketers can’t collaborate with sales to our maximum potential, we’ll fail on both fronts. I’m actually discussing this topic in greater depth at “Finding Profit” - an exclusive half-day summit for business leaders looking for new ways to drive growth. Click here for more details!